Margaret Hoopes (1893-1956) American Illustrator. Florence Hoopes (1895-1970?) American Illustrator. 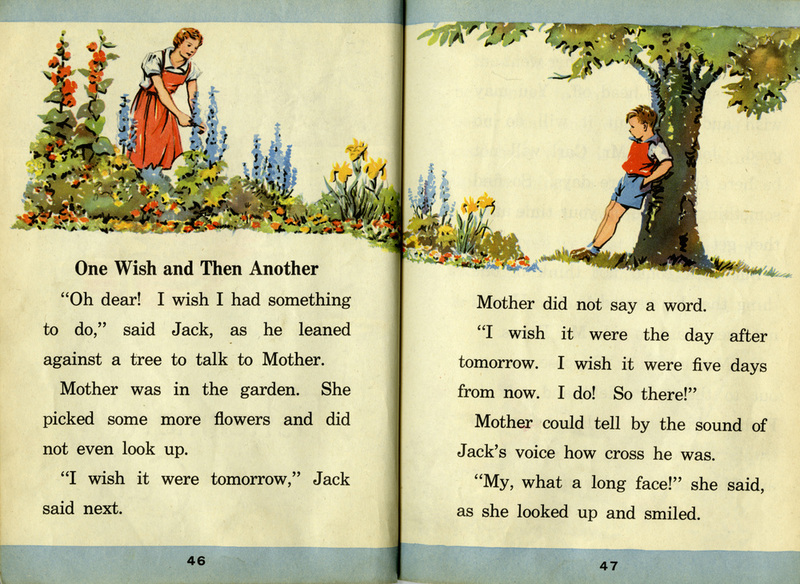 The sisters Margaret and Florence Hoopes built a career on the Alice & Jerry readers, school books issued by Row, Peterson Company in the 1930s and 40s (published into the 1960s). The readers were written by Mabel O'Donnell, a teacher in East Aurora, Illinois, who later joined Row Peterson (Evanston, IL) as an editor in 1946. How the Hoopes sisters (born in Delaware, later residents of suburban Philadelphia) got involved in the Alice and Jerry project is unknown. The books were issued in sets, and ran from kindergarten through 6th grade. Margaret and Florence (division of labor, unknown) worked up watercolors for each book. The watercolors range in approach from well-mannered neutral washes over controlled drawings to a more gestural approach with patchy brushwork in surprisingly saturated color. In spots they become nearly abstract. Ironically, the Hoopes sisters built their reputation in works devoted to the education and socialization of children, though neither seems to have married. (Genealogical data shows that Margaret certainly did not). Such contradictions are not rare. For many women, children and career operated on a toggle switch: it was one or the other. The Hoopes' illustration work in the Alice and Jerry books has plenty to recommend it. That said, we should resist the temptation to look at these volumes nostalgically. Students of visual and material culture should engage these things as culture core samples. If we pay attention, they tell us much about social inclusion and exclusion in the 1930s, as well as highlighting echoing national myths from the 19th century. Day In and Day Out book cover. Written by Mabel O' Donnell & Alice Carey. Published by Row, Peterson and Co, 1936. Singing Wheels book cover. Written by Mabel O' Donnell. Published by Row, Peterson and Co, 1940. Singing Wheels book cover. Written by Mabel O' Donnell and Alice Carey. Published by Row, Peterson and Co, 1936. Hoopes, Day in and Day Out. 1936. Hoopes, If I Were Going. 1936. Hoopes, Down the River Road. 1938. 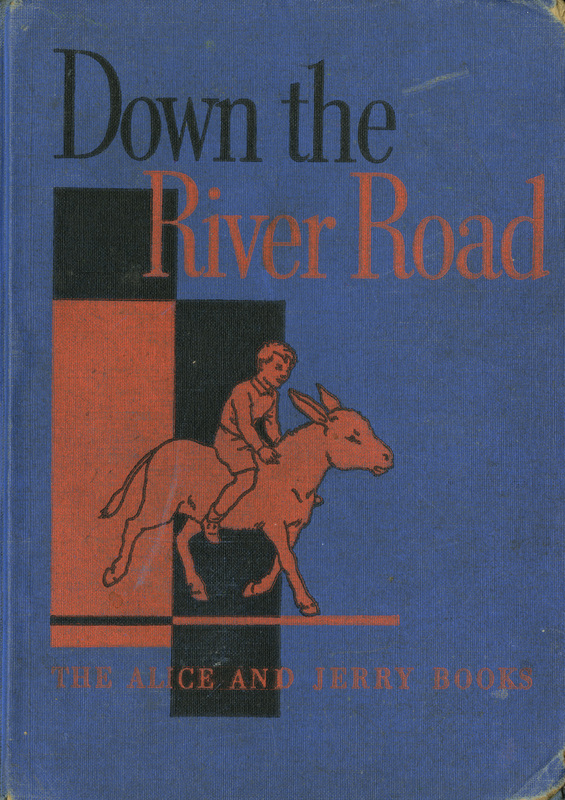 Down the River Road book cover. Written by Mabel O' Donnell. Published by Row, Peterson and Co, 1938. Hoopes, Neighbors on the Hill. 1943. Neighbors on the Hill book cover. Written by Marjorie Flack and Mabel O' Donnell. Published by Row, Peterson and Co, 1943.